Rarely has a film been more deserving of ironic quotation marks around part of its title than The Amazing Spider-Man. Coming almost exactly ten years after Sam Raimi's big-screen take on one of the most iconic of Marvel characters, the Marc Webb ((500) Days of Summer) directed reboot tells the over familiar story of Peter Parker (Andrew Garfield), a nebbishy young man who decides to don spandex and swing around New York after being bitten by a genetically-altered spider. At the same time, he tries to woo Gwen Stacy (Emma Stone), the prettiest girl in school, avoid getting caught by her police captain father (Denis Leary) and still get home for dinner with his Uncle Ben (Martin Sheen) and Aunt Mae (Sally Field). It's tough having radioactive blood. It would be unfair to review The Amazing Spider-Man by comparing it to Spider-Man (2002), since any new version of the Peter Parker saga was always going to struggle to live up to the reputation of its damn near iconic forebear. However, Webb's film does so little to differentiate itself from Raimi's that it's hard not to draw parallels, especially since almost every change ends up being for the worse. Though the specifics of the story differ - this time around Parker is pitted against Dr. Curt Connors/The Lizard (Rhys Ifans) rather than The Green Goblin; Gwen Stacy fills the love interest space vacated by Mary-Jane Watson; there is some new half-hearted backstory suggesting that Peter's parents were murdered by Oscorp and/or Connors - the big-picture approach to the material is pretty much the same, with Webb and his writers hitting the same story beats that Raimi did without ever really putting their own stamp on the material. The film in general, but particularly the first third, feels horribly perfunctory, as if everyone involved was just going through the motions of making a Spider-Man film without trying to make their Spider-Man film. The end result is a film completely devoid of personality which lazily trades on the audience's familiarity with the story instead of actually going to the trouble of telling it well. Actually, it's wrong to say that the film lacks personality, because it definitely has one, albeit of the split variety. The tone of the film veers wildly from that of being a relatively straight-faced and serious film about a troubled young man coming to terms with his new found powers and the mysteries of his past and a downright wacky teen comedy in which those same powers allow Peter Parker to mess with his fellow students or accidentally beat up strangers on a train. The end result of this cinematic schizophrenia is a film that is simultaneously too goofy to take seriously and too dour to be funny. And let's be clear: this has nothing to do with the idea of Spider-Man making quips in the middle of a fight, since that is something that has been an ingrained part of the character since his creation, but everything to do with the way in which Spider-Man will make jokes and toy with someone he believes killed his uncle. It completely destroys whatever power is contained in Peter Parker's bloodlust, whilst the very real damage he sustains in the process of fighting crime make the jokes seem horribly out of place. This also cuts to the central problem of the film, and the way in which it most obviously falls down in comparison to Raimi's film; the essential inelegance of its storytelling. Spider-Man was by no means an astonishingly well-written film, but it was a lean and effective film that told its story with minimum fuss but maximum impact. The Amazing Spider-Man is exactly the opposite, labouring the details of its plot to such a degree that they become utterly meaningless and damage the character at its heart. In addition to feeling tired in its approach to the actual origin of Parker's powers, it also takes much too long to get moving and get to the scenes of him discovering his abilities for the first time, which it illustrates using some particularly regrettable first-person sequences that resemble a clumsy Mirror's Edge knockoff. Apart from that, though, the film bungles arguably the key moment in Spider-Man's entire story: the death of Uncle Ben. His murder at the hands of a criminal who Peter only minutes earlier refused to stop is rushed and does not have the emotional weight it needs to give Peter's decision to become a crime fighter weight or heft, especially because Ben is dead when Peter finds him, depriving the characters of their last moments together, moments that an actor of Martin Sheen's calibre would have knocked out of the park. More than that, Peter's prolonged and unresolved search for the murderer robs the story of the key moment when Peter actually decides to dedicate himself to being a hero. Instead, he pursues a vendetta for selfish purposes which happens to then lead into the main plot of the film, making the shift from vigilante to all-purpose hero feel forced. 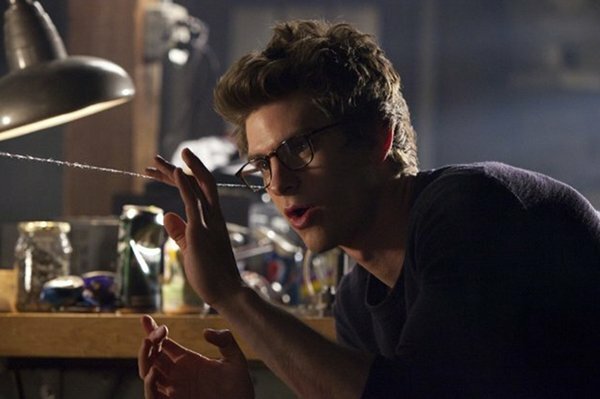 As Peter Parker, Andrew Garfield is fine but blank. For much of the film he acts as little other than a mechanism that moves the plot forward, and it's hard to think of him as a character at all, rather than a cog in a rather clunky machine. He has no real personality, he just reacts to whatever happens and winds up being boring, especially because he's often pared with actors who have much less to do but at least bring some spark with them (Denis Leary, in particular, brings a lot to the pretty thankless role of playing a stern father/jaded cop). He comes alive somewhat whenever he shares screen time with Emma Stone, and the two have undoubtedly great chemistry, but even there his mealy-mouthed mumbly act is frustrating more often than charming. The main problem is that Garfield never seems like Peter Parker, just someone filling his spot until he gets here. The same problem afflicts the film as a whole. Even labouring under the shadow of Raimi's films, The Amazing Spider-Man comes up short, offering tepid spectacle and half-hearted romance with none of the wit or verve of its predecessors, all the while struggling with a dissonant tone and a fatal inability to differentiate itself except in the worst possible ways. The performers do their best and it's all very well presented, but other than that it's little more than a blurry photocopy of a much brighter original.